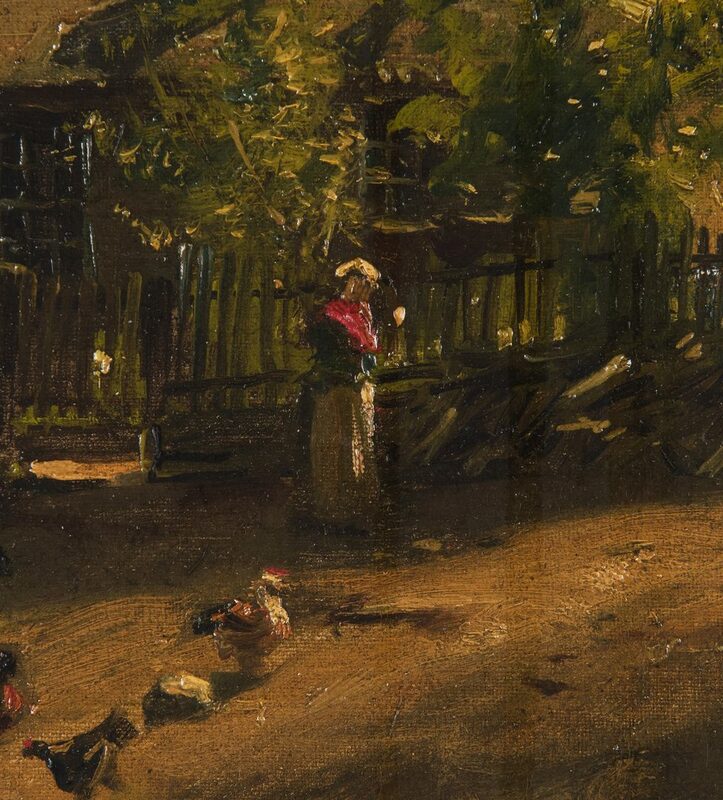 Gilbert Gaul (New York/Tennessee/New Jersey, 1855-1919) oil on board landscape painting, depicting a woman standing in a Tennessee farmyard with chickens at her feet, a cottage in the background. Signed lower right. 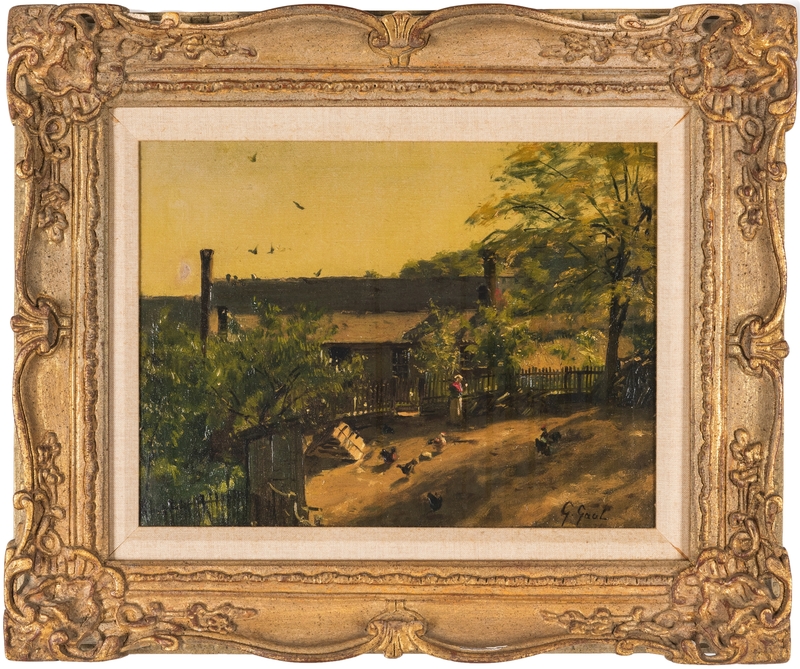 Exhibited under the title "Untitled (Tennessee Farmyard)" at the Tennessee State Museum, November 22, 1992 to February 28, 1993, "Gilbert Gaul: American Realist," and featured in the exhibition catalog on page 16. 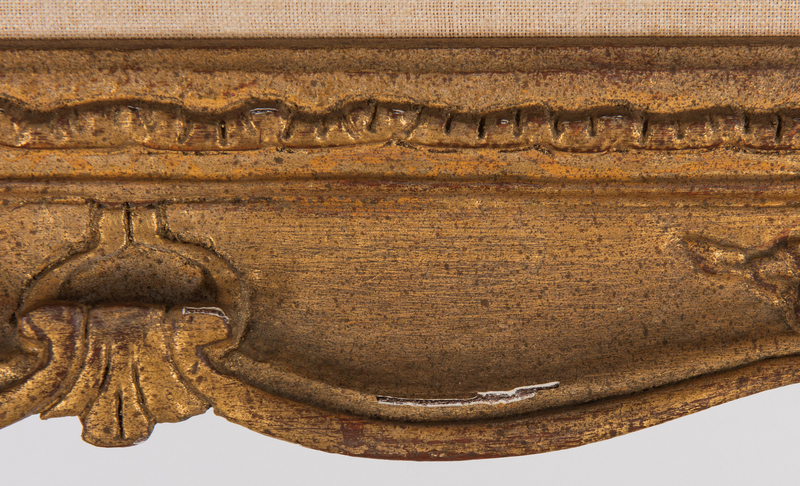 Carved giltwood frame with linen liner. 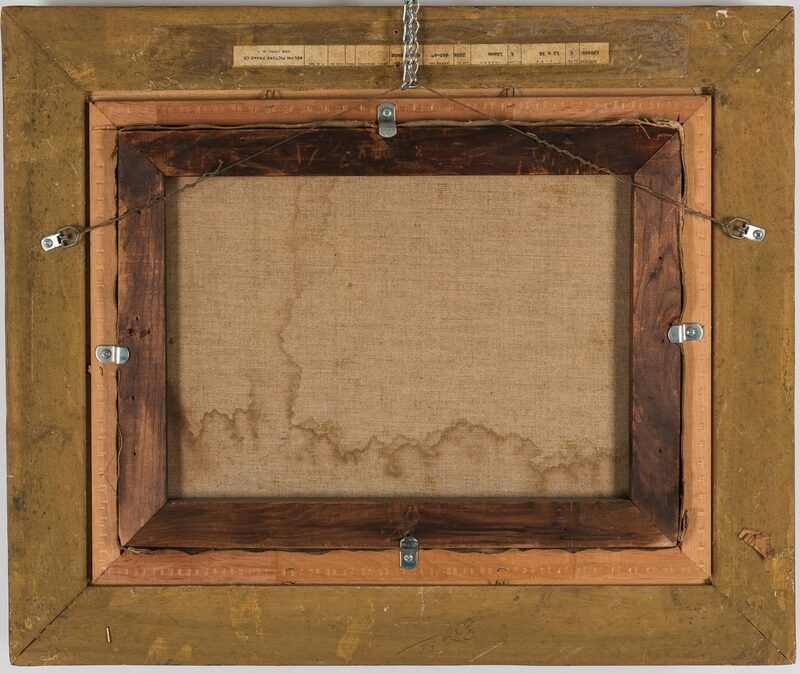 11 1/2" x 15 1/2" sight, 20" x 23 1/2" framed. 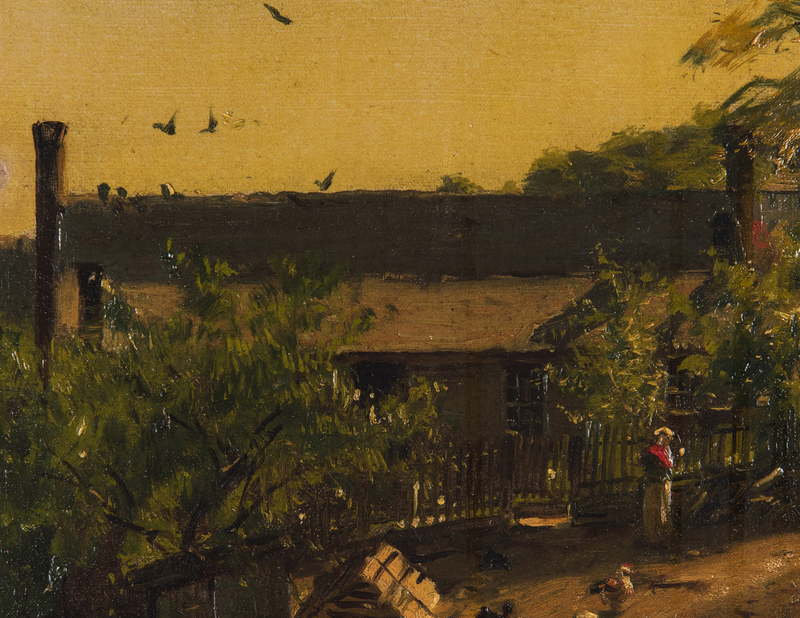 Exhibition catalog provides date attribution of circa 1891-1895. 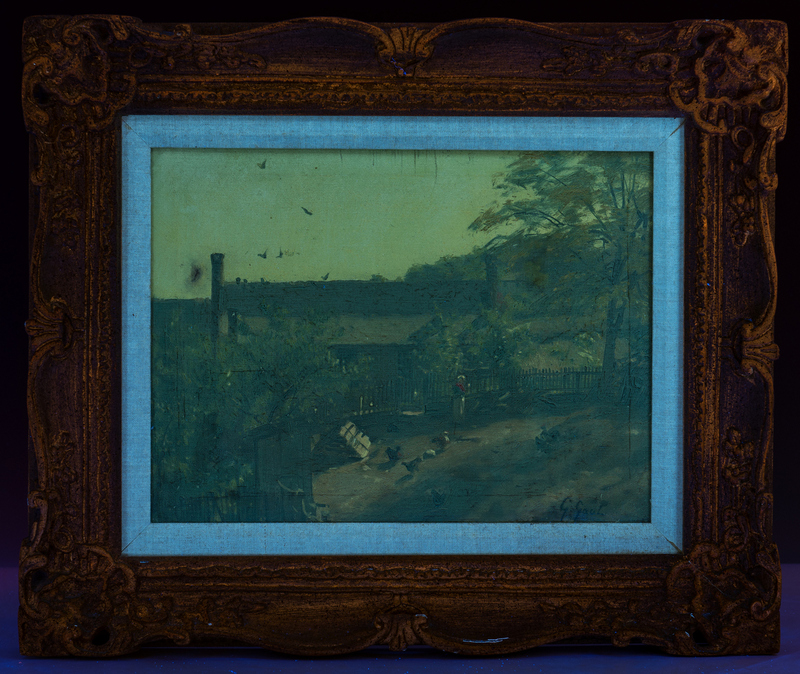 Provenance: the estate of Delle Brown, Nashville, TN. Delle Brown and her late husband Malvern Brown were, for many years, the proprietors of Trace Tavern Antiques. 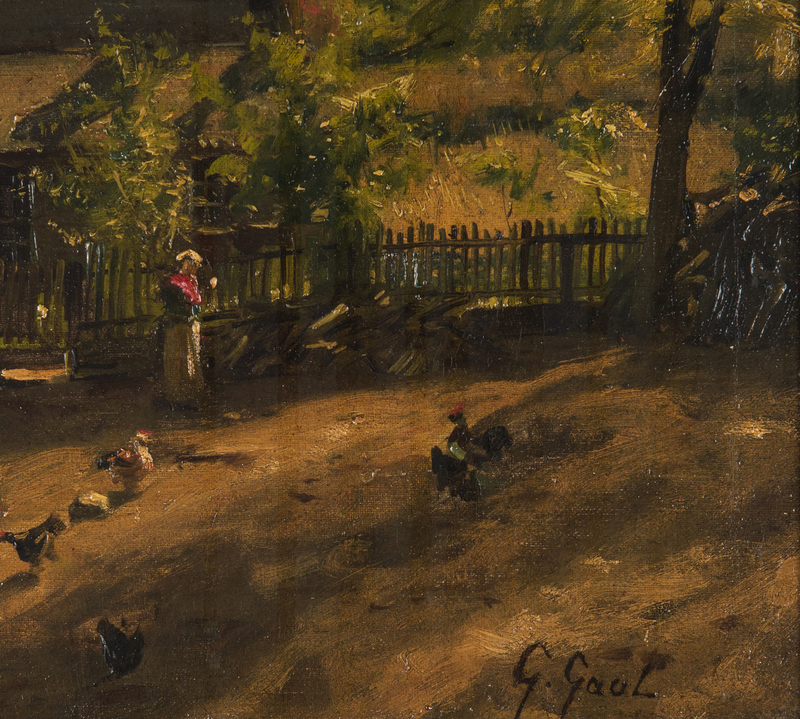 Biography: New Jersey born artist Gilbert Gaul studied art with Lemuel E. Wilmarth at the school of the National Academy of Design from 1872 to 1876, and privately with the noted genre painter, J. G. Brown. 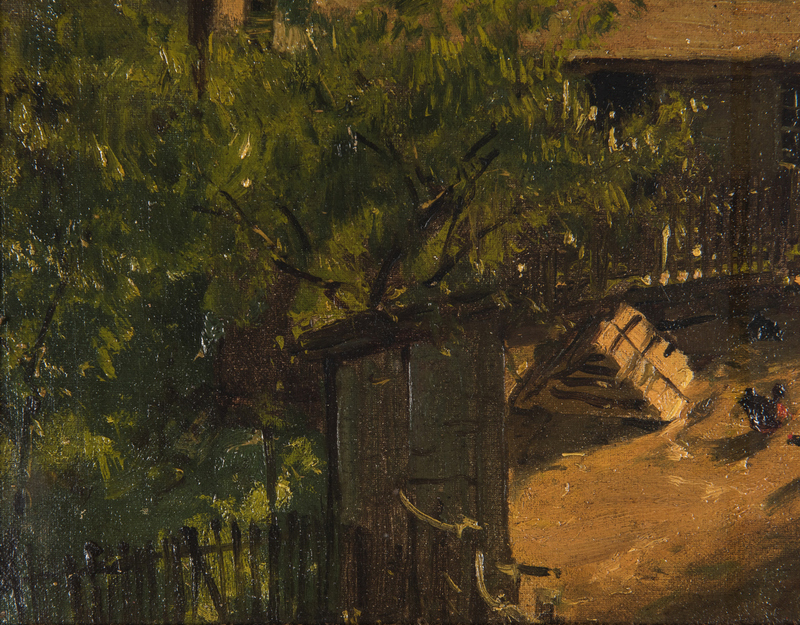 He continued his training at the Art Students League during 1875 and 1876. 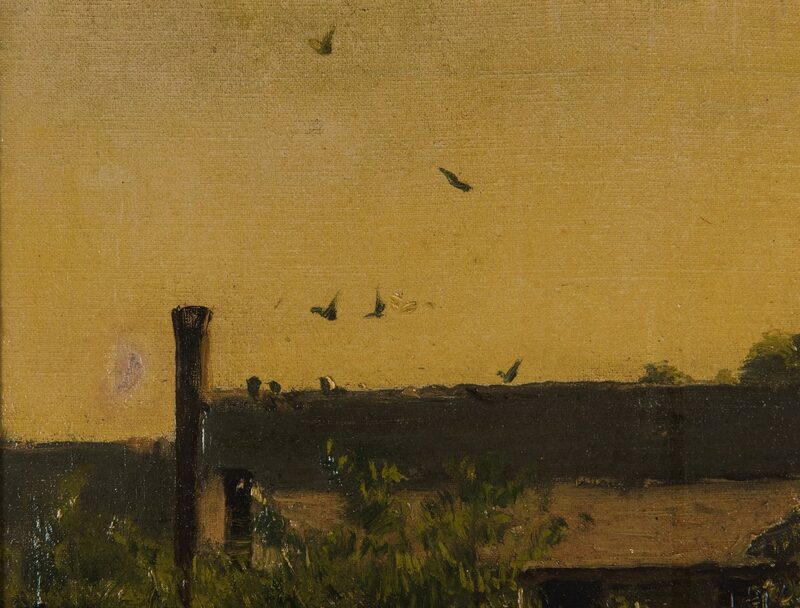 Gaul first exhibited his work at the National Academy in 1877. In 1881, he inherited a farm in Van Buren County, Tennessee, from his mother's family, and lived there four years to fulfill terms of the bequest. 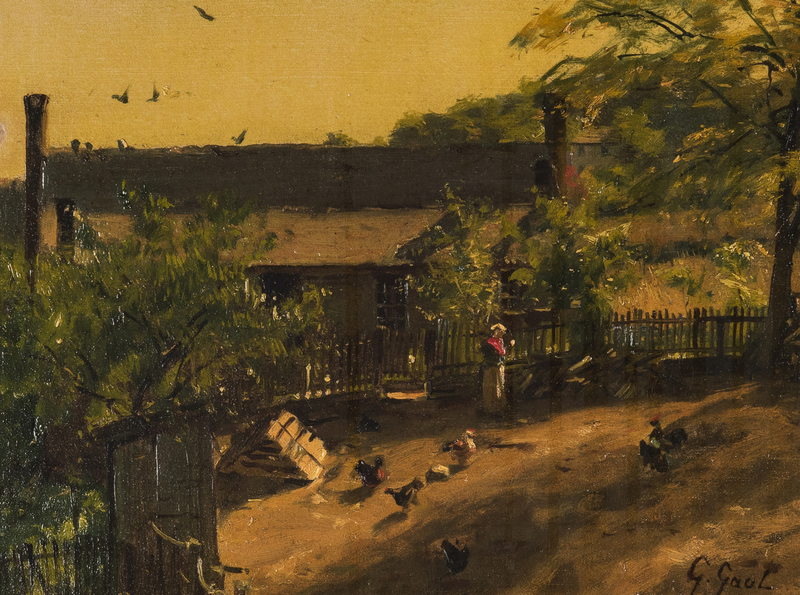 In 1885, he returned to New York though he also continued to spend time at the farm in Tennessee. 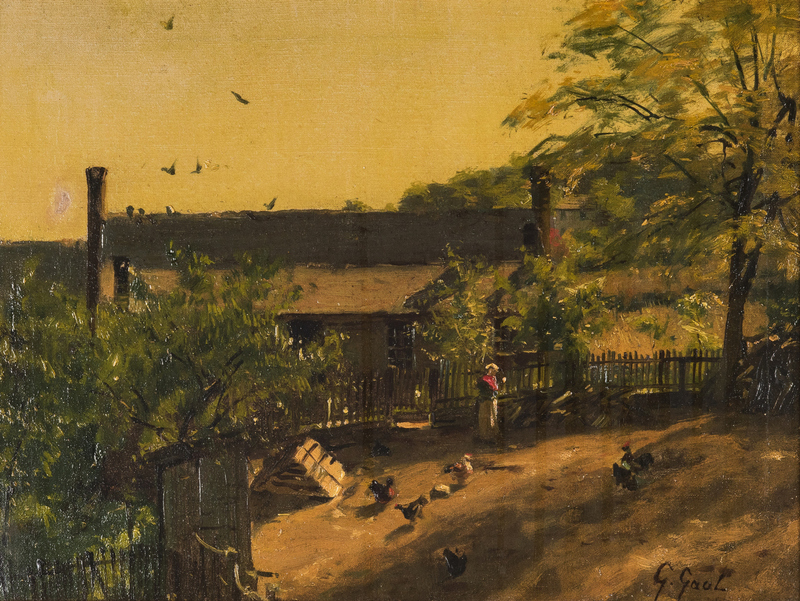 Gaul gained acclaim for his illustration art and portrayals of Civil War scenes. He became a regular exhibitor at the National Academy annuals between 1877 and 1902; in 1882, he was accorded the status of full academician–the youngest artist to attain the honor. He exhibited at the 1889 Paris Exposition; the 1893 World Columbian Exposition in Chicago; and the 1902 Pan-American Exposition in Buffalo, where he was awarded medals. 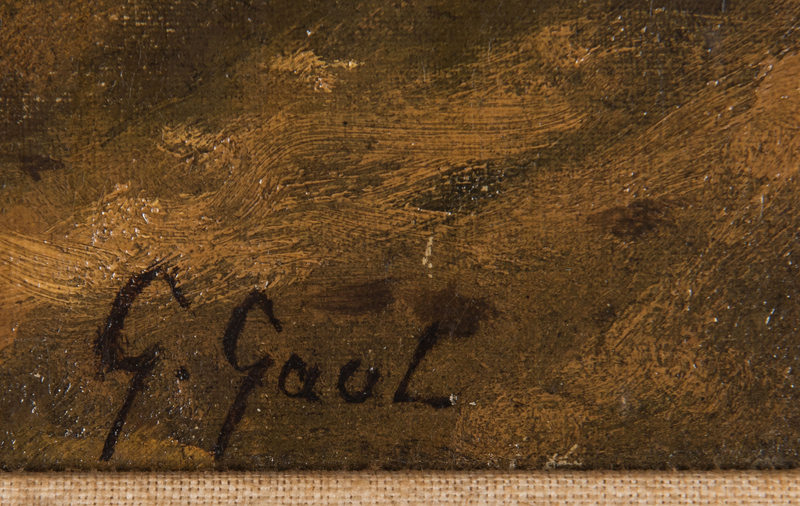 In 1876 Gaul made his first trip to the American West, an area for which he developed a particular affinity. He made numerous western trips in subsequent years, photographing and rendering scenes of Native Americans and the frontier, which he would later work up into paintings in his studios in New York or Tennessee. In 1890, he worked for the United States census on reservations in North Dakota. He also visited Mexico, the West Indies, Panama, and Nicaragua. An account of his travels was published in Century Magazine in 1892. 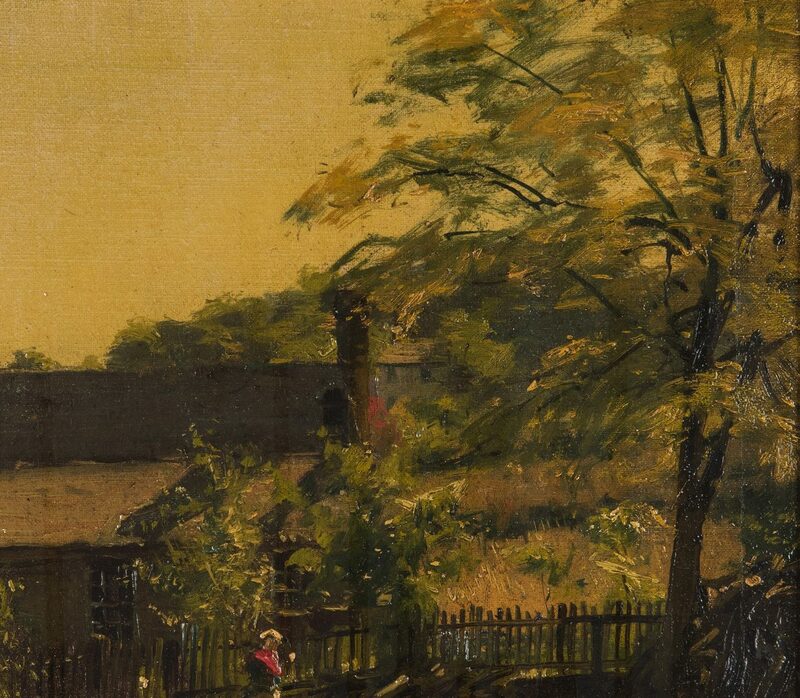 In 1904, he returned to Tennessee and settled in Nashville. The decreasing interest in Civil War subjects resulted in financial hardship for Gaul. He gave private art lessons, and taught at the Watkins Institute, Nashville, and at Cumberland Female College, in McMinnville. He also spent time in Charleston, South Carolina. 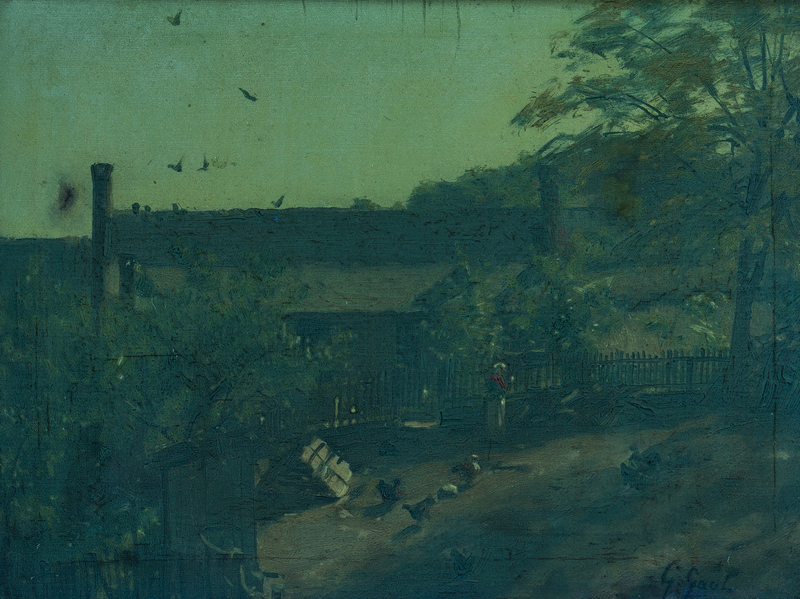 By 1910, he had moved to Ridgefield, New Jersey, where he continued to paint and live out his remaining years. (Biography courtesy The Johnson Collection). CONDITION: Relined. 1/2" area of repair in sky area, upper left quadrant. 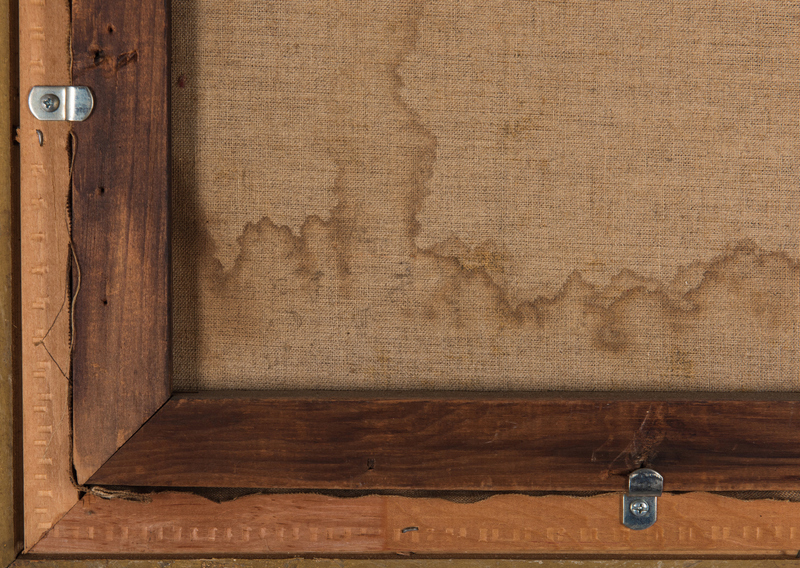 Some staining to rear of canvas at lower edge, does not appear to affect front of canvas. Overall yellowed varnish layer.